My faith is important to me. Faith is important to a lot of people in Eastern Kentucky. However, sometimes people can go overboard when it comes to their faith on social media. “Keep scrolling if you hate God, share if you love Him.” Those of us that have Facebook are constantly seeing these ridiculous photos plastered all over our news feed. Or ones like the one below that say ignore for hell and share for Jesus. I chose this particular one because it wasn’t gruesome or appalling. Sometimes I will be scrolling through Facebook and one of these will pop up…but the images will be so repulsive that I almost unfriend the person who shared it. It’s like… really?? Why would you share that on your wall!? It absolutely cracks me up! 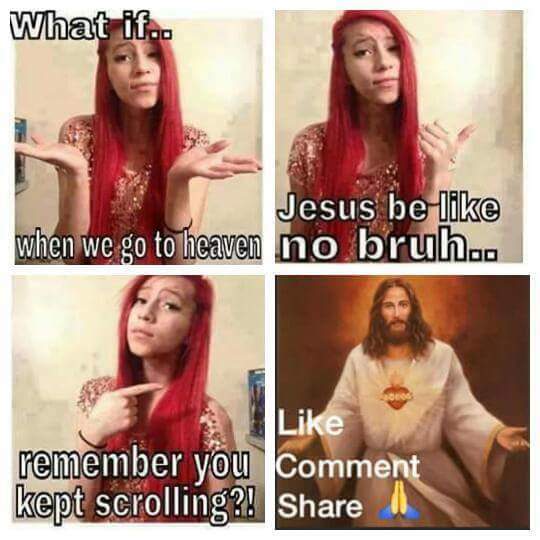 These pictures had me wondering….do people really think they will be refused entrance into the pearly gates because they didn’t “like” or “share” one of these pictures? I’m sorry but God doesn’t scroll through Facebook and record everyone who does this. Trust me….he is worried about more important things then how you spend your time on Facebook (unless you use it for sinful purposes…then that’s a WHOLE nother story). I am by no means downplaying peoples right to proclaim their faith on social media. I love seeing people talk about how much they love God and the great things he is doing in their life. I am guilty of this….and I don’t care who knows it. 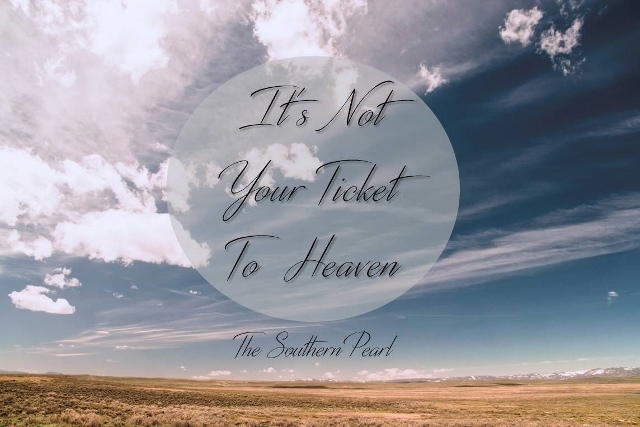 However, isn’t that an insult to God to say you will only get into Heaven because you shared a photo on Facebook? Does it make me any less of a Christian because I refuse to share these photos on Facebook? Absolutely NOT! Does it give the people who share it a better advantage of getting into Heaven…no. Sadly those who share these photos don’t realize what they have been suckered into. These photos generally include gruesome or highly inappropriate material along with the picture of Jesus. The creators of these photos are actually “pulling one over” on everyone. They are slipping terrible images that are getting shared along with those of Jesus. So you think you are being a good Christian by sharing them but the intent is for you to share the inappropriate material as well. One image in particular that comes to mind includes three photos of a female’s derriere (wearing a thong) and the photo of Jesus crying. 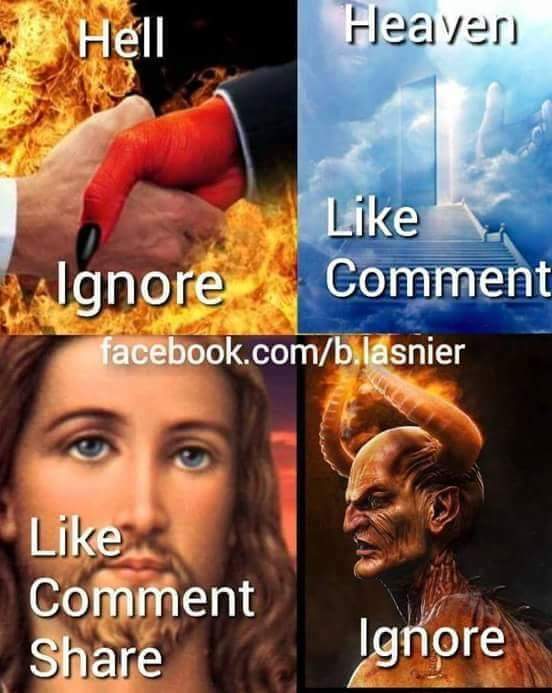 Two of the pictures said “like,” one of the photos the backside was badly bruised and it said “ignore,” then the photo of Jesus said “like,” “comment,” “share.” Does anyone else see a problem with this?? I sure do! First, when people share this photo for the picture of Jesus they are also sharing the photo of a partially naked female. Can that not incite lust? Yes! Do you want children (who shouldn’t have social media anyway) to be exposed to a partially naked lady like that? No! Not to mention why would you want to help promote a picture that showed a woman’s behind? Second, if you “like” this photo that can mean one of two things; you are “liking” for the half naked lady or you are “liking” for Jesus. Do you really want people to have to guess which one it is? Either way….it’s not very appropriate or tasteful. Especially if you have your church family on your Facebook. Imagine your pastor or his wife seeing that….awkward! This post is not aimed at anyone in particular. I am also not trying to talk bad about those who do share these photos. I realize that those who share them have good intentions. However, your intentions are completely different than those who created the photos. I am merely trying to bring awareness when it comes to these images. Please refrain from sharing them…you are doing yourself an injustice if you do. Just stick to the traditional testimonial posts that include your real life blessings from the Lord. Then you won’t have to worry about taking part in sharing these terrible and distasteful images.